The Drag & Drop Template allows you to challenge your Participants’ knowledge by asking them to drag images onto their correct descriptions. 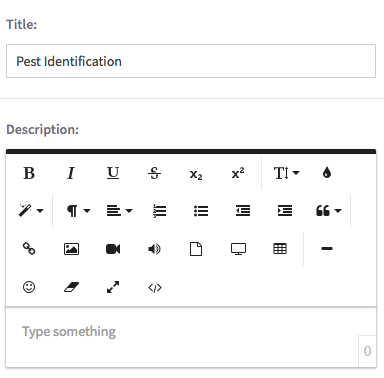 The Drag and Drop Template allows you to challenge your Participants’ knowledge by asking them to drag images onto their correct descriptions or labels. This makes the Drag and Drop Template perfect for testing visual recognition. Step 1: Select the Drag and Drop Template from the ‘Interactive/Challenge Templates’ panel. 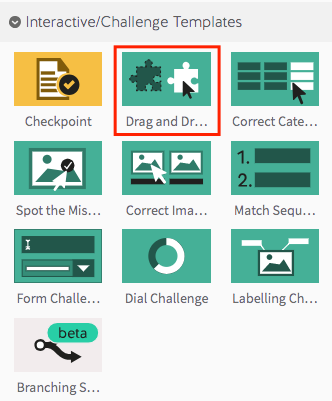 Step 2: Drag your Drag and Drop Template into the Lesson Pathway. Step 5: From the edit screen, you can choose to change your title, and enter a description. A description is optional, and will appear under your title if you chose one. Step 6: To begin adding questions to your template, click the ‘Add New Question’ button. Step 7: Select an image for your first question by clicking the ‘Add Image’ button. Image Tips: Try not to make your images too large in the Drag and Drop Template, as they won’t work too well on small screens. For 3 images, we recommend using sizes of 250 x 270 pixels. For 4, try 220 x 240. For 5, try 200 x 220 pixels. For 6, try 160 x 180 pixels. For 7, try 220 x 180 pixels. For 8, try 220 x 180 pixels. For 9, try 170 x 180 pixels. For 10, try 170 x 180 pixels. Step 8: Select whether you’d like your question to be a fake answer. If you select this option,the image will appear on the screen as an option but will not have a correct answer, meaning that the images to drag will outnumber the correct answers. This will make your template harder to complete. Step 9: In the ‘Text’ box, write the answer to your image. This will be the text that the image will need to be dragged onto to get the question right. Step 10: When you’re done, select the green checkmark. Step 11: Keep adding questions by repeating the process from Step 6. You can re-order each question by using the ‘drag and drop’ handles on the left. The order they’re displayed in here is the order that will be displayed to Participants. Step 12: To preview your challenge template, click on the ‘preview’ icon.